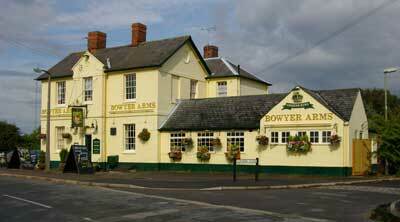 The village pub, the Bowyer Arms, was built around the middle of the 19th century on the site of an earlier farmhouse, no doubt to provide hospitality services for users of the nearby railway station. The name derives from the Bowyer family who, at the time, owned the Radley Hall Estate and many properties in and around the village, having inherited them from the Stonhouse family in 1794. Morlands, the Abingdon brewers, originally rented the property from the Bowyer estate and eventually purchased it in 1882. With the demise of Morlands and the Abingdon Brewery in 1999, the pub passed into the hands of Greene King, and was extensively renovated both internally and externally and, particularly in summer when the many hanging baskets are in full bloom, provided an attractive centrepiece to the village. In October 2012, the pub was given a new look and some internal refurbishment. Carol Cavanagh, who was tenant manager with her husband Eddie from 1991 to 2008, was Clerk of the Green Cloth from 2002 to 2006.